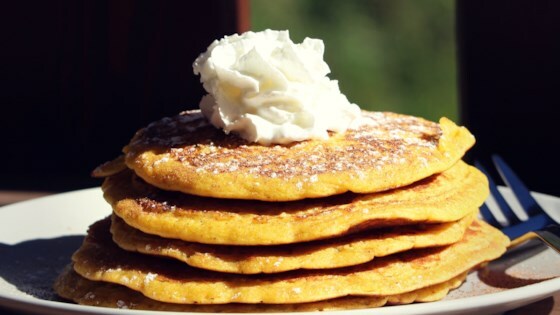 "Sweet pumpkin and delicate autumn spices make this recipe enjoyable any day of the year! Serve with maple syrup, whipped cream, and pecans if desired." Mix quinoa flour, brown sugar, baking soda, cinnamon, allspice, salt, and ginger together in a large bowl. Whisk buttermilk, pumpkin puree, eggs, and oil together in a separate bowl. Pour over quinoa flour mixture; stir just until batter is blended. Preheat a large nonstick skillet over medium heat; spray with cooking spray. Pour 1/4 cup batter into the skillet. Cook until bubbles form and edges are dry, 3 to 4 minutes. Flip and continue cooking until the center springs back when pressed, 2 to 3 minutes. Repeat with remaining batter. Substitute soured milk for the buttermilk if preferred. Very delicious pancakes. The recipe is right on as far as quantity and execution. Quinoa and pumpkin are a nice combination of flavors. I topped them with whipped cream and maple syrup, yum! !